지식정보화사회에서 산업기술과 경제발전으로 더불어 국민들은 건강하고 쾌적한 주거환경에서 인간의 존엄과 가치의 실현과 행복을 추구하고 있다. 반면에 지방자치단체에서는 지역의 경제발전과 토지이용의 효율화를 위해 조례로 도시 건축물의 고층화ㆍ수직화를 허용하거나, 용도지역에 따른 용적율ㆍ건폐율 제한, 건축물의 이격거리 제한의 완화함에 따라 일조권, 조망권 침해와 더불어 환경상 프라이버시권의 침해에 대한 분쟁이 증가하고 있는 실정이다. 프라이버시권의 환경상 침해문제는 피해자 건축물을 기준으로 일조권, 경관권, 조망권의 침해와 더불어 가해 건축물의 소유자, 건축주에게 소송을 제기하면서 인근 주민에 의한 프라이버시권 침해문제로 인한 손해배상소송, 건축허가취소소송 등이 증가되고 있다. 그러함에도 환경분쟁에 있어서 프라이버시권의 개념정의나 법리문제에 관하여 학계는 침묵을 지키고 있으나, 법원의 판례는 환경분쟁에 있어서 프라이버시 침해로 인한 재산적 가치하락에 따른 손해배상과 위자료 배상을 인정하고 있다. 따라서 환경분쟁에 있어서 프라이버시권의 개념을 명확히 정립한 후, 그 법적성질을 규명하고, 프라이버시의 법적 보호요건, 프라이버시권의 독자적 권리 인정여부, 건축법과 주택법 및 환경정책기본법상 환경상 프라이버시의 보호의 입법적조치, 위법성 판단 기준과 시기, 손해배상 산정 기준, 환경분쟁조정법상 프라이버시 침해의 환경피해오염 구제대상 확대. 행정개입청구권등 공법상 권리구제 등에 관한 법적 문제를 검토하고 그 개선방안을 제시한다. People have realized the human dignity and value in healthy and comfortable residential environment with the growth of industrial technology and economy in knowledge information society. Allowance of high-storied and vertical building construction in urban areas by local governments and mitigation of capacity and building-to-land ratio limitation and building separation distance limitation have increased the disputes on the violation of right to sunshine, prospect right, and right of environmental privacy. Issues of violation on right of environmental privacy have also increased lawsuits against building owners from the violation of right to sunshine and prospect right and resulting suits for damages by neighboring residents. Nevertheless, the academic circles have kept silence on the concept definition or legal principles of right of environmental privacy, but court precedents presumed compensation for damages from the depreciation of property caused by the violation of environmental privacy. Therefore the concept of privacy right in environmental dispute which is the right to enjoy freedom or confidence of private life according to new construction of a harmful building in the area adjacent to damaged housings should be clearly established, its legal properties should be examined, legal protection factors of right of environmental privacy, recognition of an independent right, illegality standard, illegality timing, and measure of damages should be extended to the objects of dispute conciliation on the violation of right of environmental privacy by environmental dispute mediation committee. 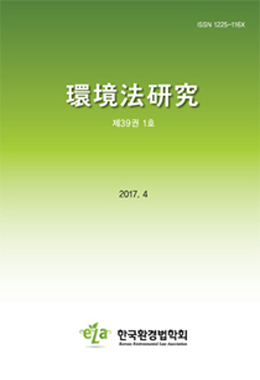 Legal problems on legislative actions of protection of environmental privacy on building act, housing act and environmental policy act, claim for administrative intervention, revocation action for building permit, and protection of rights on public law by action for state compensation were examined to suggest improvement methods.